If you're a fan of high-end, luxury cosmetics, you've most likely heard of Terry de Gunzburg: makeup artist to photographers like Helmut Newton and Irving Penn, creative director of Yves Saint Laurent Beauté (and inventor of the Touche Eclat highlighter-concealer), founder of the eponymous By Terry makeup line. Gunzburg launched her first fragrance collection last year, and it recently arrived in the United States. Gunzburg has said, “I wanted to reconnect with perfumes from the beginning of the century, like those of Guerlain and Robert Piguet — they were extravagant experiences. That’s not to say mine are dusty old fragrances. 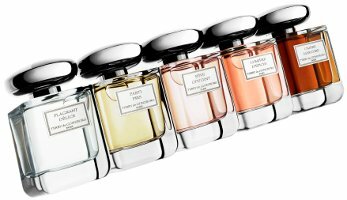 They’re contemporary — clean but not watery, opulent but not heavy.”1 I've been sampling her five fragrances one by one; today I'll cover two of them, Parti Pris and Ombre Mercure. Parti Pris includes notes of tuberose, orange blossom, Turkish rose, ylang ylang, vetiver, sandalwood, vanilla, tolu balsam, Turkish tobacco absolute, rockrose and labdanum; it is described as "a colourful scent with a passionate temperament that dislikes shades of grey and encourages emotion." I'd actually describe it as "gracious" and "polished" rather than "colourful" and "passionate." After a slightly bitter citrus note in its initial phase, Parti Pris blooms with a creamy-sweet tuberose. It's certainly not a big, dramatic tuberose; if you're devoted to Serge Lutens Tubéreuse Criminelle or to the iconic Piguet Fracas, you'll find Parti Pris a bit reserved for your taste. The rest of the fragrance is a cascade of silky white petals (ylang ylang, rose, something like freesia? ), resolving in a dry down of very gentle vetiver with a drop of vanilla. Parti Pris is very feminine, like a classic ivory silk blouse. It could be enjoyed nearly year-round, in many different situations. Ombre Mercure is both literally and figuratively darker than Parti Pris, and it's my current favorite from Terry de Gunzburg's "haute parfumerie" collection. It is "a fatal attraction between mystery and refinement...intense, powerful and purring on the skin just like a feline," with notes of iris, rose, ylang ylang, violet, jasmine, patchouli, vanilla and benzoin. If you like your irises powdery and oriental, you're in for a treat. Ombre Mercure is velvety and rich (yet not overwhelmingly so), and its rooty-sweet iris is interwoven beautifully with the other dusky floral notes, the woodsy patchouli, and the honeyed vanilla. No one note dominates, yet it still feels like an iris fragrance overall. Everything old is new again, with a twist; Terry de Gunzburg may have been thinking of Guerlain and Piguet, but she also admires Serge Lutens; I might be reminded of L'Artisan, and others, as I continue to try these perfumes. If you've already sampled them, do feel free to share your thoughts in the comments. Terry de Gunzburg Parti Pris and Ombre Mercure are available as 100 ml Eau de Parfum ($195). They are available at Barneys New York and via the Terry de Gunzburg website. 1. Via Interview, A Kind of Magic at Harrods Magazine, December 2012. I’ve never heard of Terry de Gunzberg. Ombre Mercure sounds really pretty. It might be too floral for my tastes but I’d like to try it. Her cosmetics line has a high-end cult following — her Baume de Rose lip balm is amazing, although I have to admit I’ve never splurged on a full-size jar of it! Have you ever compared it to Dior’s Baume de Rose lipbalm? I’ve never tried the Dior one… I’ll have to check it out at Sephora!! I can’t resist anything with “rose” in the name. I don’t own makeup besides nailpolish and I use honey as skin care. But I do love lipbalm. Tea with rose petals makes my lips look so good after I drink a cup so I’ve wanted to splurge on rose lip balm. But I’m quite a cheapo so I just stick to Nivea and Burt’s Bees. If I see these around Hamburg, I’ll be sure to try Ombre Mercure. I sniffed these when I was travelling around Europe – they were at Skins in Amsterdam. Ombre Mercury stood out as the star in my books – its wonderful to see that you liked it as well. Yes! I still need to try the others a second (and third, etc.) time, but this was the one that really made me stop and think! I totally agree with Jessica about being in for a treat with Ombré Mercure if one likes oriental style iris which I do, together or separate. In fact I have succumbed happily and put my $where my mouth is. I also agree with her assessment of Parti Pris which is my second favorite as I do not like the big tuberose types. OM is my new favorite of the season along with Lubin’s Idole which I am saving to open this month. Different it is, but equally nuanced and beautiful for me. Thank you, Dora! “Nuanced” is a good description. And I’m not really a fan of cold, “metallic” irises or overly green, “rooty” ones, but a powdery iris with a warm, woody base? Yes, please! They’re expensive — but then again, her lipsticks cost $50, so we couldn’t really expect bargain pricing for the fragrances! I did see them in person at Barneys — they’re quite substantial! and the cap is, apparently, inspired by a drop of mercury.